Discussion [Release Note] Zywall Series - V4.33 firmware has been released! [Release Note] Zywall Series - V4.33 firmware has been released! For more details, please refer to the below Link. We've made some changes to better serve you. 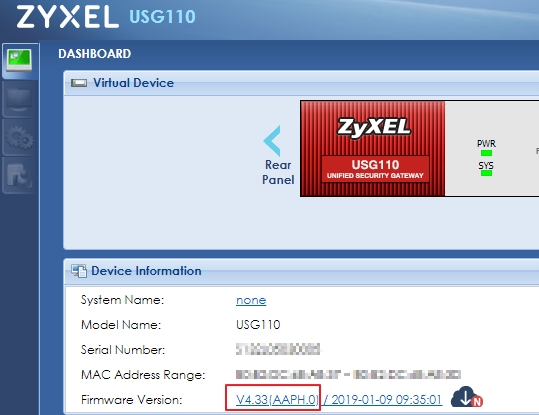 Please log into your myZyxel account to obtain the latest firmware, ZLD4.33 for ZyWALL USG security gateway. Moreover, you can also online upgrade the latest firmware from cloud helper on ZyWALL Series . Don't have an account yet? Sign up. Can you comment which weekly builds are included? Are the fixes from WK52 included? and see if this release is proper to you. Hi Please can you agree if fixed on 4.33 problem with Range/Subnet settings ? it's a bit tricky with a ITS-WK version to validate the information "what WK edition is in the final release"
So, is there a onepager in your team, where is the WK number placed and you can inform the users like "we recommend to use WK52 and do not upgrade to 4.33"
Hi please is fixed Range/Subnet problem in firmware 4.33 ? I can confirm the solution has been included. can you pls check the fixes on USG60W with 802.11r reenable fix ? i've 4.33 for about 60 minutes installed and had to rollback, cause the The WLC of the USG60W has repeatedly disconnected all of the WLAN clients and dose not provided a stable connection. The well-known bug "802.11r re-enabled after bootup" is still present in v4.33. Therefore the question up to which WK-version are the known bugs fixed ? After the rollback to the WK52 my USG ran well without this issues. we will release the patch firmware by the end of Feb.